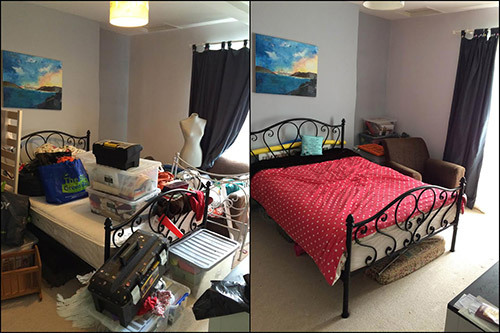 Organising and decluttering to get more ease and space back to any room. We can transport bags of items to an Exmouth based charity of your choice (Devon Air Ambulance, Hospiscare, Sue Ryder, Clic Sargent, British Heart Foundation). Supporting a house move at any and all stages, from initial preparation for estate agents pictures, packing, room planning, to unpacking. Assisting in house renovations and return to home, both in auditing and packing, plus unpacking quickly at the end of the project. Sorting home offices and paperwork. We establish working systems bespoke to your needs, and provide a confidential waste bag for decluttering paperwork. Working carefully and respectfully with public agencies, householders and families where there has been more pronounced hoarding in order to allow householders to gain access to key functions in their home. Click here to view the terms and conditions of working with Change Your Space.